Liquid transfer specialists often receive a call that a pump seal has failed and is spraying fluid all over the place. At hundreds of plants every year, liquid transfer specialists are taken to a pump room with product being transferred because multiple pumps are leaking and dripping due to the sealing device not working correctly. This problem usually results in lost production time and numerous maintenance hours. It is normally remedied with the same repair components that did not hold up to desired life expectancy in the first place. Many plants are combining the efforts of the reliability engineer and maintenance personnel; therefore, these problems are being addressed. Plant personnel are looking for viable solutions that also have a direct payback on uptime and maintenance costs once the sealing problem is resolved, and not just extemporized with the same failing component. This effort can be strengthened when the reliability or maintenance team also partners with a distributor liquid transfer specialist and the manufacturer’s representative for specialized expertise. Here is an example. The pump user, a manufacturer in the steel and aluminum industry, had multiple vertical turbine pumps in a pump room and there was many different approaches applied to seal these pumps. Some were packed, some had cyclonic separators and many variations of mechanical seals were used. But it seemed that none of these efforts to seal the pump addressed the actual problem that was causing the sealing issue. The group looked for the root cause of the problem, found it and pooled their experiences of application, design and engineering to develop an approach that addressed the root cause. In this application, it was determined that the vertical single rotary (VSR) cartridge mechanical seal and an application management system would not only identify some of the root cause problems, but also come up with a standardized solution for the multiple vertical turbine pumps. Multiple man-hours would not be used to remove the pumps from the application in order to accomplish the repair. The management system’s reliability was key in focusing the efforts of equipment verification, product recommendations, product training and inventory control. The application at its root cause had excessive runout as its main issue. The VSR was ideal for the application due to its ability to eliminate the housekeeping issues and extending the mean time between repair/replace (MTBR) from six to eight months to more than three years. As a single external cartridge-mounted rotary seal, the VSR is designed for installations where shaft deflection exceeds the limits allowed by off-the-shelf cartridge seals. Excessive radial clearances designed in the seal make it ideal for vertical turbine pumps in power plants, pulp and paper mills, municipalities and applications in relatively clean, lubricating fluids. Whether sealed with compression packing or a mechanical seal, the issue with sealing vertical turbine pumps is that as the bushings wear, the amount of runout they encounter exceeds the limitations of the sealing device. Compression packing is soft and as the runout increases, it opens the inner diameter (ID) of the rings, creating a leak path along the shaft. This requires constant gland adjustments, which creates wear on the shaft. 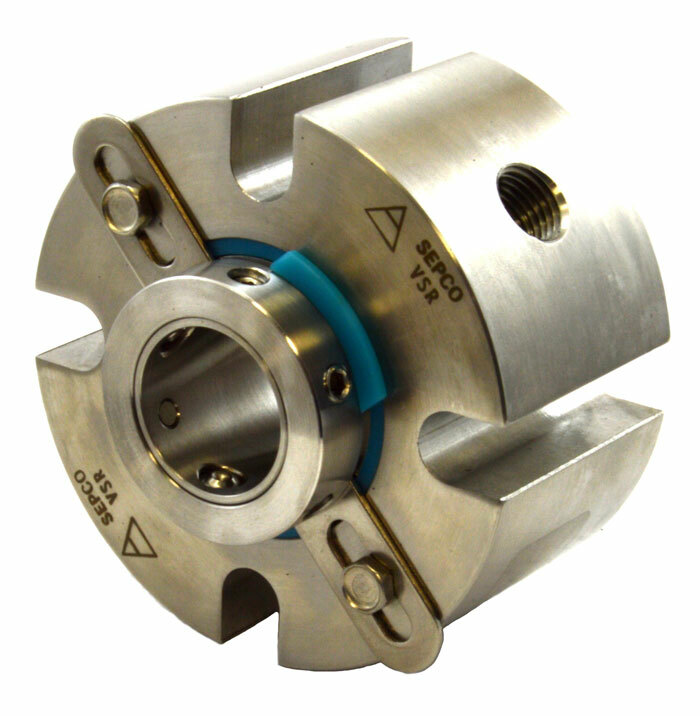 When using a standard cartridge-mounted mechanical seal or a split seal, the excessive runout exceeds the clearances of the internal components, causing the seal to fail prematurely. The plant now has a dry pump room as well as an increase in reliability and runtime. Another result was the decrease in the number of storeroom items stocked for all of the different solutions that had been implemented. Image 3. Taking a closer look at the vertical single rotary (VSR), you can visualize the center section being allowed to deflect up to 3/16-inch total travel. Selection of the sealing mechanism involves understanding the chemical makeup of the product being pumped, as well as knowing how the transfer media is affected by all of the different conditions it will encounter during its journey throughout a pumping system. These conditions typically include thickness and viscosity at different velocities, temperature variances, etc. For instance, with packing in an application, the common practice is to purchase a replacement set of packing made of all of the same material. Many times, that packing will be stocked on a bulk roll in the maintenance, repair and operations (MRO) cage and used in many different applications, often misapplied. By understanding the strand makeup and manufacturing process of the packing used and what is causing the failure, there may be a better solution by combining different materials in the packing ring combination, creating a longer lifespan between the repacking of the pump. 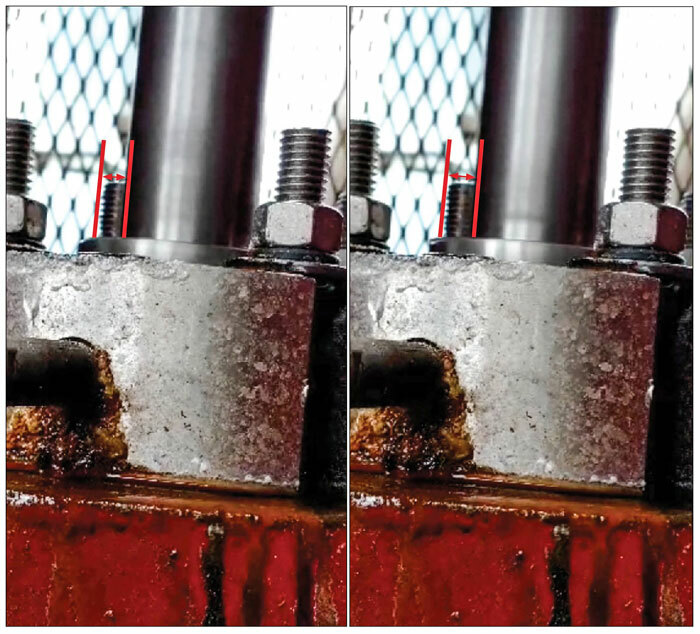 Sealing mechanisms should not just increase the time between repairs, but rather maximize the time between repairs without an unnecessary increase in cost. This same strategy should be used for mechanical seals, materials of construction and workmanship and using newer technologies that may be the answer to the particular issue. The value of a knowledgeable and qualified third-party expert is often overlooked by cost reduction restrictions. But the benefit of many years of field experience of manufacturers’ engineers and the componentry training specific to that equipment can be a huge asset and ensure reliability. These same experts also frequently provide on-site training, which can provide long-term value to a facility. Matt McMahan has worked in the process pump industry for 16 years. As a pump specialist for the Process Pumps Division of Motion Industries (MiPP), he trains branches, troubleshoots for customers, and sizes pumps for applications. He is the interim product group manager with a focus on product marketing, supplier interaction and business development. Terry Roberts has worked in the fluid sealing industry for 20 years. As a Midwest regional manager at Sealing Equipment Products Company (SEPCO), he provides training, sales support and solutions to channel partners and their customers. Roberts is on the technical committee of the International Sealing Distribution Association (ISD). For more information, visit motionindustries.com or the Mi Process Pump Specialist site.